Like with the other Narnia books, I've read this one as a Buddyread with Arjen. We both liked this book the best in the series. That's also the reason I give the book 5 stars. It's better than the books I gave 4 stars. The fun thing about this book is that I've asked for it in my review of the first book. I wanted more history on Narnia and that's exactly what this book is giving me. It was a simple but beautiful story. Connection with first book: There are a lot of connections with the first book in this book. Especially some of the characters. I'd definitely recommend reading the Publication Order, because this was so much fun to read after reading The Lion, The Witch and The Wardrobe. I can definitely imagine it to be fun to read this one first and after that the other books, but I liked the way Arjen and I chose to read this series. Creation of Narnia: In this book, you learn more about the creation of Narnia and the beasts and magical creatures that live there. You learn more about worlds in between and this book is a bit of a rung towards The Lion, The Witch and The Wardrobe. Best in the series: I liked this book the best. There was no unnecessary information, the storyline was always exciting and a lot was happening in very few pages. Likeable characters: The two children in this book were after the Pevensies my favorites. I've seen a lot of children in Narnia books to be grumpy and spoiled and stubborn and it's just not as much fun to read. I think that one of the reasons I gave this book 5 stars, were the children in it. This is a fun read in the Narnia series. Even if you've only read The Lion, The Witch and The Wardrobe I'd highly recommend to read this book. The connections between the two books are so much fun to read. 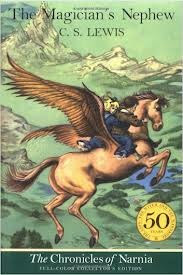 I'm glad that I could give a book from the Narnia series 5 stars! "What you see and what you hear depends a great deal on where you are standing. It also depends on what sort of person you are."